The members of the Frederick County Civil War Roundtable (FCCWRT) all share a love of history and the history of the Civil War in particular. In 1989, twenty or so people in the Frederick County region established our roundtable. 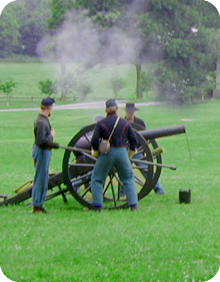 Their commitment to preserving, and sharing our history of the Civil War period continues today. The members represent every age, occupation, and experience. We meet at The National Museum of Civil War Medicine in Frederick, MD. The meetings and presentations are free and open to the public. They are held September through May on the third Thursday of the month. To see our meeting schedule, click here. Scholars and historians discover new documents and materials every year parting the mists of history and providing more understanding. Go to our Join page for more information on joining FCCWRT. If you have any questions or comments, click here to contact us.